As a professional photographer visiting family at Maple Grove, Minnesota during the peak season of fall foliage colors, I enjoy bringing my Nikon d800 camera for a hike at Elm Creek Park Preserve. 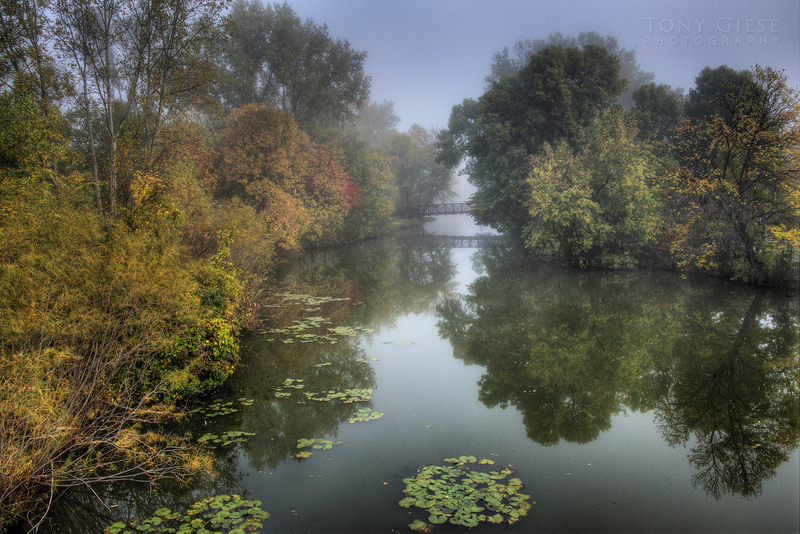 Foggy fall morning of bridge crossing Elm Creek, Maple Grove, Minnesota. So nice to see and photograph the brilliant tree colored reflections early morning as if a landscape was painted and ready to frame. 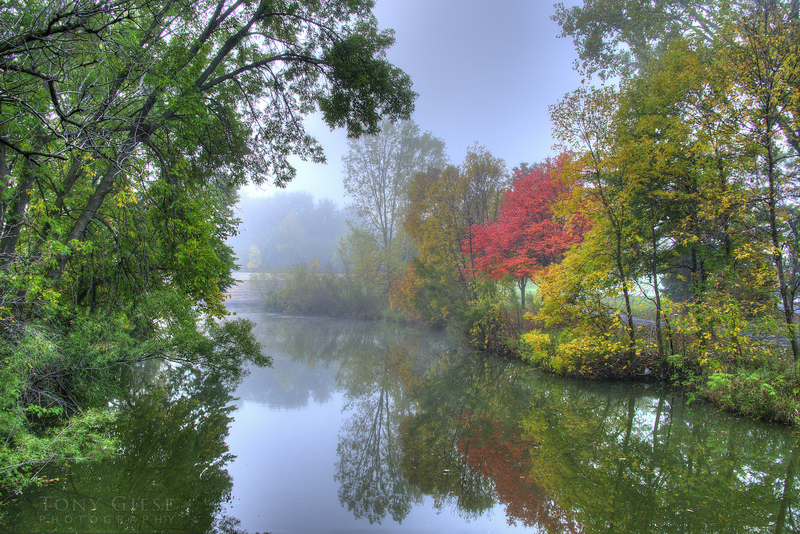 The early morning fog helps add distance to the landscape, steadied by a tripod for bracketing exposures to create colorful HDR images. A painted pallet of fall foliage color, Maple Grove, Minnesota. As you walk the the trails near Elm Creek you see all types of trees, some are labeled by the park for identification. Many have beautiful colorful branches touching the water. 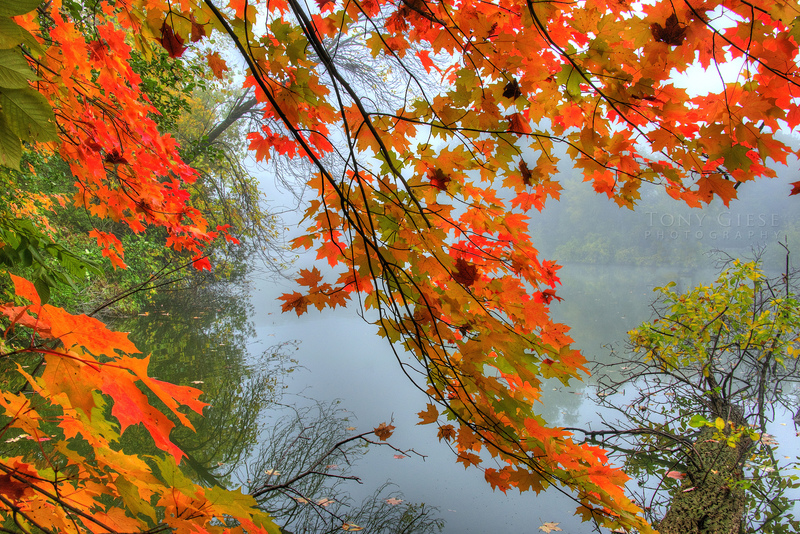 Balancing on a log out on the river, I almost slipped and fell as I photographed this brilliant colored maple tree branch reaching out over a foggy Elm Creek. The best showing of glowing golden-orange-crimson fall colors are right here in central United States at Elm Creek Park Preserve, Maple Grove, Minnesota. One lone red tree on Elm Creek creates center of interest the foggy river reflects back into the distance. It’s fun as a artist hunting for seasonal peak colors eager to see and photograph the many variety of hues October has to offer in Minnesota. 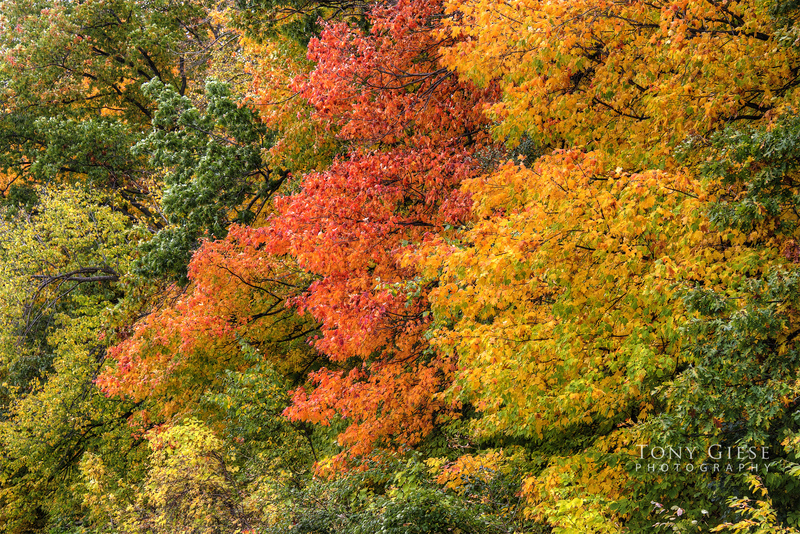 There are so many lakes and parks to choose from as trees reaching their color peaks. 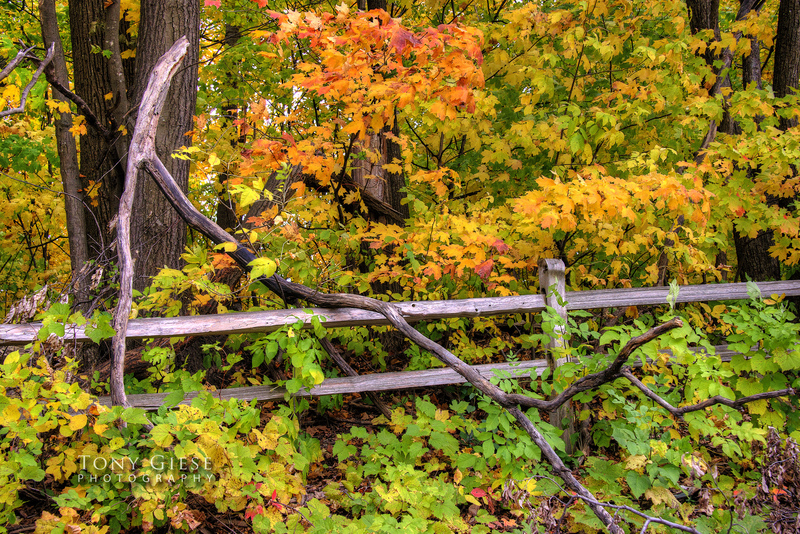 Fallen tree branch crossing wooden fence leads your eyes around composition of this fall colored image. Mixed coniferous and deciduous forests have shown a wide array of color for only one to two weeks, making these peak times for good for a fall color road trip. Look into checking the Minnesota Department of Natural Resources’ fall color finder for the latest updates across Minnesota. This entry was posted in My Posts and tagged Elm Creek Park Reserve, Fall color refections, fall color road trip, fall leaf colors, Fog, foliage, HDR, Landscape photography, Maple Grove, Minnesota, professional photographer, Tony Giese Photography. Bookmark the permalink.